Silver Arctic-Pro 21377 is a countertop style portable ice maker with a digital control panel and a 26 pounds of daily ice making capacity and will produce the first ice within 8 minutes. You can choose between two sizes- large or small cubes depending on what you need or prefer for your drinks. 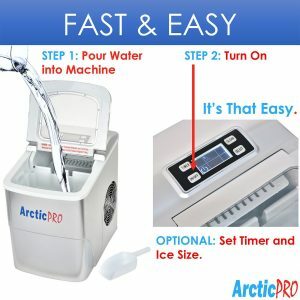 Arctic-Pro Ice Maker is a fairly compact, lightweight and portable ice machine that weighs 17.2 pounds and measures 11.5 x 8.7 x 12.5 inches. It is more compact than some other ice makers on the market like Igloo. You can easily relocate and use it in a variety of settings including outdoor summer pool parties, at the bars, home bars, offices, picnics, camping, boating, RV trips, tailgating and in your home kitchen. But it needs to be plugged into an AC 110 outlet with three prongs. You’ll get ice very quickly and you’ll not need to buy ice from the shops anymore. This will save you on time, money and effort, so it is quite a convenient product to own. And you’ll not need to think about running out of ice, especially when you have guests over and need a refill of their drinks. Because the compressor on this machine is quite powerful and efficient with a daily ice making capacity of 26 pounds. It is very easy to operate as you just need to add some water in and press the On button on the display panel and it will start making ice immediately. And as an optional step you can set the time and ice size- small (.75 x .75 inches) or large (1 x .75 inches). Or you can choose to run it all day and let it do the cycles by itself. It comes with a plastic ice scoop and an easily removable ice tray to move the ice to wherever you need to. It has a lid with a transparent window that lets you see what’s going on clearly or check the level of ice without needing to open it and let the cool air escape. This ice maker has a smart intelligent design with a fill sensor and will tell you when the ice bucket is full and there won’t be overfilling. The digital panel is quite intuitive and easy to understand with just the Timer, On/Off, Select and Clean buttons. There is a decent capacity in the water reservoir to make a few batches of ice cubes in a row. It has the same type of efficient compressor that you’d find in smaller fridges and runs very well. Please note that you can’t take these refrigerants to the service but the loading mechanism that dumps the ice can be taken. 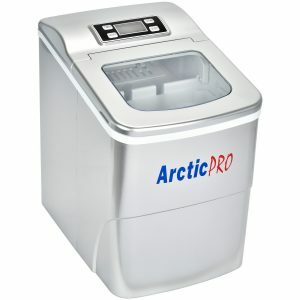 The Arctic Pro Ice Maker comes with a 30-day money back guarantee if you’re not satisfied for whichever reason. This is only because the company is very confident in their ice machines and they would be expecting a very low refund or returns percentage.